Rocker arm clips keep hot oil off the exhaust manifold, off the headers and off you by deflecting oil into the engine. Valve adjustments can be easily made while the engine is running. For stock rockers only. Fits Chevrolet, Ford and Pontiac. 8/pkg. 1015 is rated 1.0 out of 5 by 2. 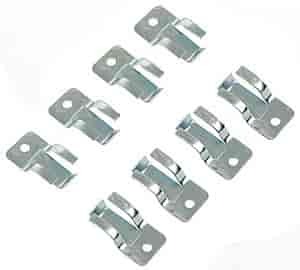 Rated 1 out of 5 by Duane223 from Rocker arm clips The rocker arm clips are ineffective. Oil continued to splash onto headers and floor. Yes, for stock rocker arms only.